Monty Python was born in May 1969, at the Light of Kashmir tandoori restaurant in Hampstead, where five Brits (Graham Chapman, John Cleese, Eric Idle, Terry Jones and Michael Palin) and an American (animator Terry Gilliam) first sat down to discuss working together on a new BBC comedy series. Since 1966, five of the Pythons-to-be had all been writing and performing in numerous eclectic comedy shows, including ‘The Frost Report’, ‘At Last the 1948 Show’ and ‘Do Not Adjust Your Set’ – the last of which featured Gilliam’s highly-original cut-out animations, which would become integral to Monty Python’s unique style. The team all agreed that they wanted to overturn the conventions of traditional sketch comedy – sketches with a beginning, middle and end, punchlines, blackouts, and topical gags. Their approach to comedy would be unpredictable, aggressive and irreverent, each episode a thirty-minute stream-of-consciousness, reflecting the revolutionary times of the late ‘60s. Coinciding with the arrival of colour television, ‘Monty Python’s Flying Circus’ made its debut on BBC1 on October 5, 1969, at 10:55 p.m. on a Sunday night, sandwiched between ‘Omnibus’ and the weather. The Pythons’ gleefully deconstructed the very medium of television; there were parodies of documentaries, game shows, commercials and chat-show interviews. But they also frequently subverted the very grammar of television itself – for example, the opening titles might appear halfway through an episode, or the end title crawl would unspool at the very beginning. The iconic BBC globe was regularly hijacked, with voice-over announcers heard eating or engaged in tortured personal crises in the background. Over the next few years the show received three BAFTA awards, including Best Light Entertainment Programme, and two special awards for its writing–performance, and for Gilliam’s graphics. The series soon gained acclaim outside the U.K., with a specially-made episode receiving the Silver Rose of Montreux, and an invitation to make a program for German television, titled ‘Monty Python’s Fliegender Zirkus’. Performed by the cast in German, it was so well-received, it led to the Python team returning in 1972 to record a second special (this time in English). 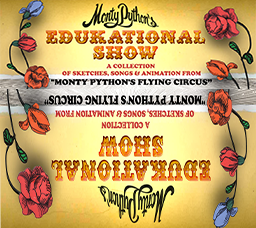 In addition to 45 episodes of ‘Flying Circus’, the Pythons produced inventive work in other media (including record albums and books). They both mined their prodigious television output and created new material that was as subversive as their TV scripts. The team’s ‘Big Red Book’ (published, with a blue cover, in 1971) sold out its initial print run within a week. Its follow-up, ‘The Brand New Monty Python Bok’, amassed advance sales of over 100,000. At the same time they also released a string of hugely-popular vinyl albums, masterfully seizing the full imaginative potential of the audio medium. (‘Matching Tie and Handkerchief’ was the first three-sided record album). It is impossible to overestimate the importance of these items. In the days before home video, it was through their books and records that fans were able to relive and memorise their favourite Python moments. 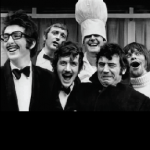 In 1971 the Pythons’ first film, ‘And Now for Something Completely Different’, was produced as a means of introducing the group to American audiences, particularly the college crowd. The movie, a remounted collection of sketches, received a surprisingly strong response in England, despite the familiarity of the material from the original TV broadcasts. The Pythons received a similarly strong welcome when they performed live on stage, on tours of England and Canada, and finally at London’s Theatre Royal, Drury Lane. Sparked by FM radio broadcasts of the Pythons’ records, imports of the books and clips shown on TV, interest in the group grew in the United States until, in 1974, public television station KERA-TV in Dallas, Texas, became the first to air ‘Monty Python’s Flying Circus’. Other PBS stations followed suit, providing an eager fan base for the group’s second movies, released in early 1975. The group had wanted to further explore the creative opportunities of feature films. Just as production of the TV series was winding down (Cleese had announced his intention to withdraw from the show), they shot ‘Monty Python and the Holy Grail’. A hilarious skewering of the Arthurian legend, it was directed by Jones and Gilliam, its low budget funded by a roll call of rock stars. It was a hit on both sides of the Atlantic. The Pythons consolidated their status as comedy stars with a series of sold–out shows at New York’s City Center in 1976. The ‘70s ended with the Pythons regrouping for what many consider their most accomplished work, the mock-Biblical epic, ‘Life of Brian’. The film attracted controversy even before the cameras started rolling, when its original producers objected to the film’s subject matter and withdrew funding, prompting former Beatle George Harrison to personally bankroll the production. It became a box office smash, despite protests from evangelicals and countless local authorities worldwide banning its screening. The 1980s saw the group begin to wind down, with a lap of victory at the Hollywood Bowl (recorded and released as a concert film), the bestselling ‘Contractual Obligation Album’, and in 1983 a final cinema outing with ‘The Meaning of Life’, a dark, ribald symphony of excess and meditation on mortality. Python, as it was, concluded with Graham Chapman’s untimely death on 4 October 1989 – one day shy of the team’s 20th-anniversary, an event celebrated by ‘Parrot Sketch Not Included’, a bumper compilation of the team’s greatest hits (bar one), presented by Steve Martin. It was the end of a golden era, and the beginning of a new one for accountants everywhere. Indeed, the surprise chart success in 1991 of ‘Always Look on the Bright Side of Life’ opened the gates to a flurry of retrospective projects aimed at the appetites (and wallets) of a still Python-hungry public. As a multimedia brand, Python kept pace with changing trends in their third decade, collaborating with 7th Level on a series of acclaimed CD-ROMs that incorporated brand new material. The games, beginning with 1994’s ‘Complete Waste of Time’, were accompanied by reissues of the TV series, books and albums, and led to the launch of their first official website, PythOnline. The 30th-anniversary celebrations began in style with a raucous appearance at the Aspen Comedy Festival and finished off back home as ‘Python Night’ took over BBC2 for a whole evening, with documentaries, tributes and brand new sketches. The 2000s was the era of Python humour returning to the stage, with the 2005 Broadway premiere of ‘Spamalot’. Written by Eric Idle and John Du Prez, this smash–hit retooling of ‘Holy Grail’ won the Tony Award for Best Musical, and was quickly followed by the “Brian”-derived comic oratorio, ‘Not The Messiah’, memorably presented at the Royal Albert Hall in a 40th-anniversary staging that featured many of the other Pythons. On 21 November 2013, the unthinkable happened: At a press conference in London, the five surviving Pythons announced that they were reuniting for a valedictory live stage show in 2014. Record-breaking ticket sales saw a single reunion show extended to a sell-out ten-date residency, and the shows were unanimously well-received by audiences as a joyous, nostalgic celebration of the Pythons’ legacy. The final reunion performance, ‘The Last Night of the Pythons’, was watched live by a 15,000-strong audience at The O2 in London, and simulcast on television and in cinemas to an estimated worldwide audience of 50 million. The reunion jamboree was complemented by ‘Monty Python’s Total Rubbish’, a lovingly-packaged deluxe box-set of the team’s discography. Five decades after Michael Palin’s ragged hermit first staggered out of the sea and gasped “It’s…”, Monty Python’s influence on comedy is incomparable, and has become synonymous with rampant silliness, and a refusal to take anything seriously. Meanwhile, Python keeps a foot in the future with a series of innovative apps, a wildly-popular official YouTube channel, and this very website, ensuring that the work of Monty Python in all its iterations will continue to be loved by future generations.